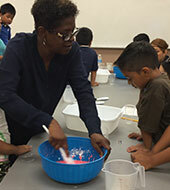 TangerKIDS Grants have equipped educational leaders with tools that open doors and inspire students through specialty programs, learning resources, and opportunities to restore the fun in learning environments. Read below as previous grant recipients share their stories. The Tanger Outlet Grant allowed me to purchase "Math Dice" games for all of my classrooms at Kreeger Elementary to use during our intervention blocks. Our students love using the games, and the grant money really helped me provide our teachers worthwhile hands-on materials. Thank you Tanger Outlets! I used our grant money to buy a year-long subscription to Inside Music. This is a cloud-based music composition curriculum that covers state and national standards and enhances students' ability to compose their own music. I found that composing their own music heightened the students' understanding of pitch, rhythm and form. Hearing their original compositions played by the whole class was an inspiring experience for the students. Thanks to the grant funding provided by TangerKids Grants Program I was able to create an enjoyable reading sanctuary for my second graders. The amount awarded allowed me to purchase 13 book collections. All the book sets are series that allow the students to continue to enjoy reading about their favorite characters. The children are so excited to see and read all these current and popular book sets, some are very familiar like the Dr. Seuss set, however some are mysterious and intriguing like the My Weird School set. I am greatly appreciative of the opportunity to have this grant awarded to my class. Not only will my present class with enjoy these book collections but future classes will too! Ms. Locke and Maria Thompson are the writers of the Grant that begins with hatching chicks. This project is all part of a larger “Wee Nutri Garden” Grant that Bowie received from TANGER Outlets this spring. 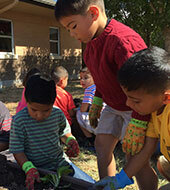 The teachers at Bowie are incorporating a beautiful central courtyard into the academic learning of students, including improvements on an existing butterfly garden, creating a bird habitat area and several vegetable gardens where Bowie students have planted over 84 vegetables. The reason we wrote this grant was to inspire our students and teachers to love the outdoors and science. What better place is there to learn about science than outside? 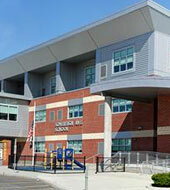 We are hoping to create a learning environment that our students will always remember. The Tanger grant which I was awarded last year has had an enormous impact on my classroom environment. I teach fourth grade, and my students have far fewer breaks from academics than in years past. The Tanger grant allowed me to outfit my entire classroom with stability balls for seating. My students now have the opportunity for some movement at all times. This change from regular chairs has improved their focus, posture, and increased their time on task, among other benefits. Plus, the kids love them! I am very grateful to Tanger for providing the funding for stability balls in my classroom. We wanted to say thank you to the Veterans of America (Galveston) in a very special and patriotic way. 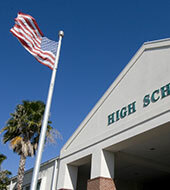 Our thoughts were of a grand ceremonial American Flag flying over our high school. When we learned of the Tanger’s Kids Grant we thought this might be the way to accomplish this. Because so many of our Veterans have graduated from our high school and served their nation with honor, we wanted to honor them. Our veterans have been serving our nation long since before the Spanish-American War in 1898. We hoped this might serve as a bridge between our veterans and our entire student body. It has definitely allowed our students to learn about service to their nation. And how American values and proper observation of the United States Flag Code, is done with “Honor & Respect”!! We especially want to say thank you to Tanger for making this all possible. Thank you SO MUCH for the grant monies, as the Tawas Area Spanish Club's two teams earned 1st Place Dance Award ("La Vida es un Carnaval") and co-Honorable Mention Award ("Quince Inviernos") during our competition at Saginaw Valley State University's 40th Annual Foreign Language Day on Thursday, November 5th. The costumes/props were purchased with the grant money, and they were beneficial in the scoring! Once again, ¡Muchas GRACIAS!